Angioplasty is a safe and minimally invasive process that can help in saving your life by unblocking the clogged arteries. 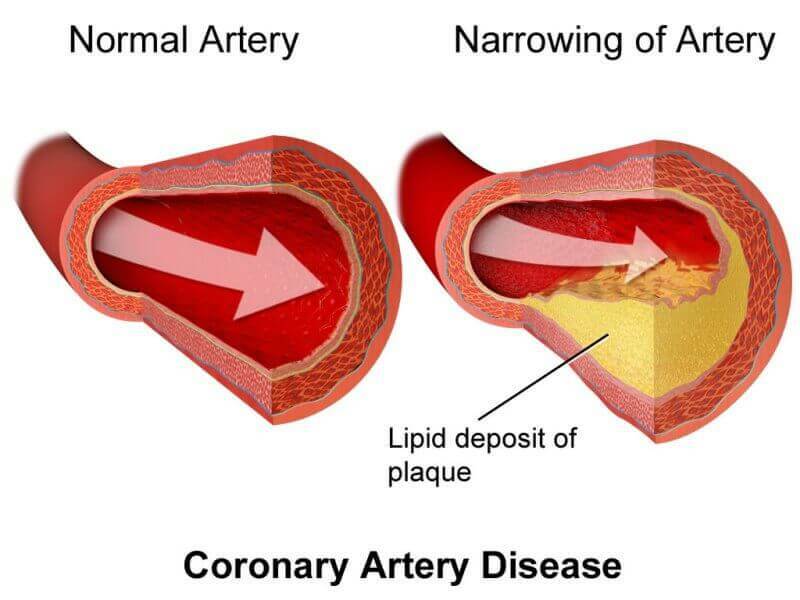 As stated above, angioplasty helps in treating your blocked arteries so as to ease the flow of blood to your heart. When the arteries in the heart get blocked, the lack of blood supply to the heart can make you experience various symptoms. Some of which include, pain, achiness, or heaviness in the leg that initiates or gets worse when you walk. Is Angioplasty the Right Option for You? Heart health: First and foremost, your heart health will be checked to ensure if the treatment would work effectively. This even helps in knowing if there is any underlying health disorder related to the heart. Your symptoms: If your symptoms are mild, they can be treated with other means such as medication. Angioplasty is a complex process and hence would only be recommended when the symptoms are very severe. The rate of blood flow: Another important factor that is taken into count by your cardiologist includes the rate of blood flow. If the restricted blood flow is 50% or more in your left primary coronary artery or more than 70% in the prime epicardial, a vessel that lies on the heart, angioplasty will be recommended. High-risk conditions: There are some health conditions that can complicate the treatment. Before performing angioplasty, your cardiologist will ensure if you suffer from any such high-risk condition. The medication you take: If you are taking certain medicines for some health condition, it will also be considered before angioplasty so as to make sure that the treatment process is not hampered in any manner. Blockage site: The cardiologist will identify the blockage site by conducting some diagnostic tests like an imaging test. It allows seeing the parts of your vascular system that have been affected and the severity of the problem. The treatment approach will be different based on the concerned area. The treatment plan would be designed considering the impact of all the factors. If the end result of the treatment process is going to surpass the risks as posed by these factors, your cardiologist will go ahead with the treatment plan. In certain cases, the blockage in the arteries of the heart can be treated better with an open-heart surgery that helps in restoring the flow of blood to the heart. But an open heart surgery is usually suggested in the cases where the blockage is extensive and present in all the three major arteries of the heart. Compared to the open heart surgery, angioplasty is less invasive. This process can access the blocked artery with the means of a tiny cut in your upper leg or the wrist. Moreover, the recovery time in angioplasty is pretty quick as compared to other surgical options. This means you can return to work immediately and get started with your usual activities without much delay. Like any treatment process, angioplasty also has its share of risks. However, given the advances in technology and techniques as used for the process, managing the risks has become quite easy. Before the process starts, the cardiologist will first give you a cardiac catheterization. This will be followed by some medication that helps in relaxing. The area from where the catheter has to go will be made numb with the help of anesthesia. 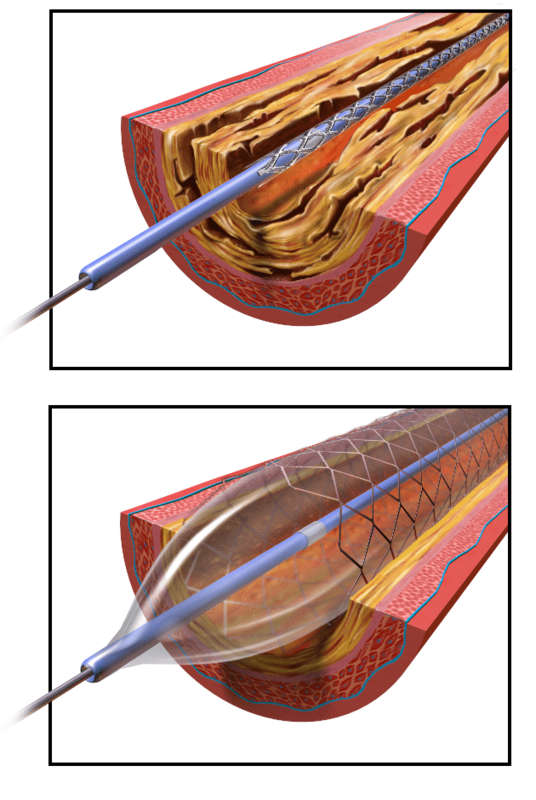 Now, a thin plastic tube, known as sheath will be inserted into the artery; in your groin or arm. Once the sheath is inserted, a narrow, long and hollow tube known as catheter will be made to pass through the sheath and reach a blood vessel and the arteries around your heart. A very little amount of contrast liquid will then be administered into the blood vessel through this catheter. As the catheter moves through the valves, major vessels and heart chambers, it’s photographed with the use of an X-ray. These X-ray pictures help your cardiologist in understanding, if the coronary arteries have been narrowed and if your heart valves are working perfectly. Based on the result, it will be decided if the angioplasty has to be performed. If angioplasty is needed, the catheter will then be moved to the blocked artery. There are various processes for angioplasty; your doctor will choose the one that best suits your needs. This process takes around 1 to 3 hours, however; depending on the preparation and recovery as needed in your cases, the time may get extended. You will have to stay in the hospital overnight for observation. 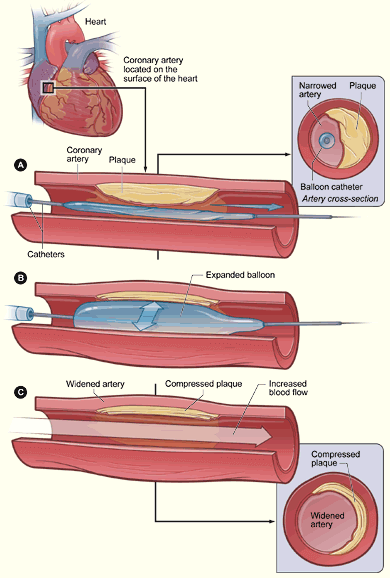 Balloon: In this process, the catheter has a small balloon tip and it is guided to the narrowed area of your artery. Once the catheter reaches the place, the balloon is inflated in order to push the plaque while stretching the artery so that it opens and the flow of blood to your heart is enhanced. Rotablation: The catheter used in this process has an acorn-shape with a diamond-coated tip. It is guided to the narrowed area in the coronary artery and the tip starts to spin at high speed, grinding away the plaque from the walls of your artery. Other microscopic particles get washed away in the bloodstream. The process is repeated as per the need of improving the blood flow. Though it is an effective process, most cardiologists prefer using stenting and balloon angioplasty as these modules are relatively easier. Stent: After balloon angioplasty, it is the most common angioplasty process used to treat the blocked artery of your heart. A stent is a small tube which acts as a frame in order to support the insides of the coronary artery. 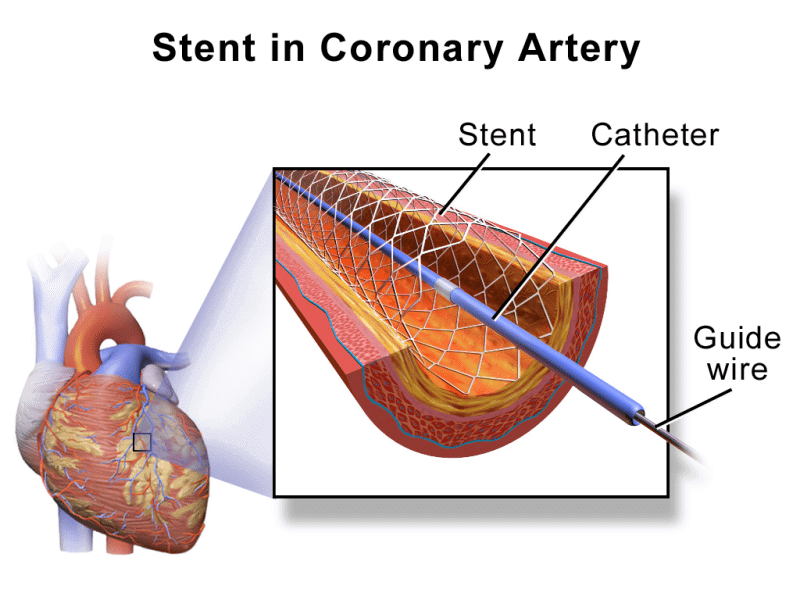 The stent is put into the narrowed coronary artery with the help of a balloon catheter, which is placed over a guide wire. Once the stent is placed at the treatment site, the balloon is inflated which makes the stent to expand to the artery size and hold it open. As the stent stays in its position, the balloon is deflated and removed. It takes a few weeks for the arteries around the stent to heal. Stents are normally made of metal which is permanent and is usually placed during the process of angioplasty to keep your coronary artery open. Nowadays, stents are even made of materials that can be absorbed by your body. Certain stents type contain medicine, these are designed to cut down the risk of your artery getting blocked again, which is known as restenosis. As there are various stent types, your cardiologist will decide the right one for you. Atherectomy: The catheter which is used in this process has a hollow cylinder attached on its tip; on one side there is a balloon and on the other, there is an open window. As this catheter is put into your narrowed artery, the balloon gets inflated, which in turn pushes the window against the plaque. There is a blade in the cylinder which rotates and shaves off the plaque protruding into the window. The plaques so shaved get caught in the catheter chamber and are removed later. The process can be repeated so as to make the blood flow normally. However, quite like rotablation, this procedure isn’t used much. Cutting balloon: This catheter comes with a special balloon tip that has small blades. As the catheter is inserted into the narrowed artery and the balloon is inflated, the blades attached to it get activated. These blades score the plaque and then the balloon presses the plaque on the artery wall. Depending on the artery as blocked and your overall health, your cardiologist will recommend the angioplasty process. In most of the cases, either of balloon and stenting will be performed as they are more effective. Before angioplasty is performed, you will have to undergo a routine blood test as well as an electrocardiogram. Both these tests will be done on a different time schedule and would be done a day before your treatment process. Once your angioplasty is over, you may have to stay in the hospital. The duration would depend on the treatment module used and your health. During your stay at the hospital, some key things have to be kept in mind. 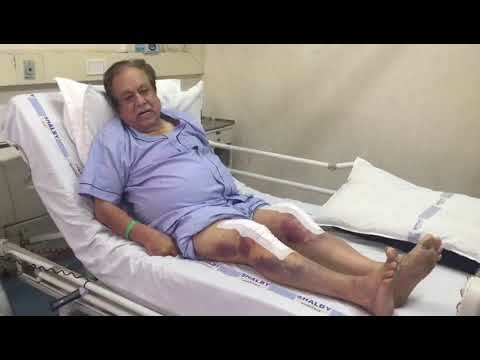 If the catheter was passed through the groin then you will have to make it a practice to lie flat for some days. Make sure that the legs are not bent till the time the groin sheath is going to be at its place. As the sheath gets removed, you may be advised to lie flat for nearly 6 hours in order to prevent the bleeding. The medical attendants will take proper care of you and monitor your condition consistently. You should take care not to eat or drink anything other than clear liquids until the groin sheath gets removed. This is because you may feel nauseated when the groin sheath is at its place. Once you are allowed to resume your normal diet, you should take care to follow a healthy diet. If the catheter was passed through the wrist or arm, a special bandage will be put to ensure healing happens properly. You should wear it for a couple of hours and it will be removed by your medical care team once the artery has healed. In case a stent was placed, then you will have to take some medicines that will help in reducing the chances of any blood clotting. You can resume your usual activities gradually and take things slowly. Don’t exert your body during the recovery process else it will hamper your recovery and the expected results. Eating healthy food is very important for your heart health, but once you have undergone an angioplasty, it becomes all the more important that you eat healthy foods. Moreover, you should ensure to avoid certain food types which can be very harmful to your heart health. Processed meats: If you are fond of eating processed meat, it is time to ditch it for a healthier choice. Processed meat contains more of sodium, nitrates, and various other preservatives which pose a great threat to your heart health. Saturated fats and Trans fats: Not all fats are bad but saturated fats found in butter, cheese, cream, fatty red meat, and poultry skin can be very harmful to you. Trans fats as found in various fried and packaged foods also contribute to high levels of unhealthy cholesterol. Refined and processed grains: It’s time to cut white bread and white rice from your list of foods. As they are processed, the health factor in them is completely lost. Food and drink with added sugar: Just skipping sodas won’t do any good; you should even steer clear of sugar-rich foods like candies, desserts, and jellies. Sugar loaded foods and beverages not only harm your heart health but even lead to weight gain which is potentially harmful to your health. Most people who undergo an angioplasty take a couple of weeks to get back to their usual activities. Before your discharge from the hospital, the doctors will give you detailed instructions for exercise, follow-up appointments, medications, wound care and getting back to your normal activities. In certain cases, a cardiac rehabilitation program can also be recommended. This program helps in supporting the angioplasty patients at every step; right from healing, recovery to resuming everyday activities. Though your cardiologist will plan the most effective treatment module for you and choose the best angioplasty process, you may encounter certain problems, which when notified timely can be treated easily. If you experience chest pain that you felt prior to the procedure or at the time when the balloon catheter was being inflated in the artery; you should consider speaking to your doctor. If the wound in the leg or arm gets bigger, drains a thick yellow/brown material, turns red or becomes painful, you should speak to your doctor. If the groin bleeds post you reach home from the hospital, call the emergency and lie down right away. Narrowed arteries can be a major threat to your heart health. Lack of blood and oxygen supply which arises due to the blockage in the arteries can prove fatal in the long run. As a treatment for unblocking the arteries and regulating the blood flow to the heart, angioplasty helps restore the normal heart functioning. Though a minimally invasive surgery, angioplasty has an intricate nature and needs to be done by thorough industry experts. You need to approach the renowned cardiologists who can offer high-end treatment module following the right surgical and medical care. Being the best when it comes to Cardiology in India, Shalby Hospitals offers an all-inclusive programme for the management of heart diseases; with high-end treatments like angioplasty. Shalby Hospitals has always been dedicated to providing world-class cardiac care, at affordable costs. Our cardiac care solutions range covers the comprehensive cardiology including Pediatric Cardiology. Having full time leading cardiologists, cardiothoracic surgeons, Interventional cardiologists and Pediatric cardiac surgeons of India who possess the cutting-edge techniques, Shalby offers services and treatments with the aid of latest innovations, matching the global benchmarks.